IN KENYA, as in many African countries, when government spokesmen say that the judiciary is independent, foreigners tend to be skeptical. They may be less so in future. On September 1st the supreme court in Kenya ruled that the country’s disputed presidential election, which took place on August 8th, will have to be held again within 60 days. The decision could prove to be a watershed in Kenya’s development into a functioning, modern democracy. But in a country where elections are hard-fought and the results usually disputed, sometimes violently, it could equally herald a new round of uncertainty and chaos. The court’s complete ruling has not yet been released. But the panel of judges did not decide that Uhuru Kenyatta, the incumbent and apparent winner, actually lost. 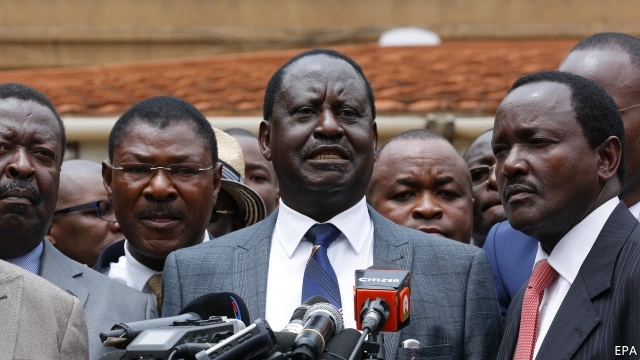 Nor have they endorsed the opinion of Raila Odinga (pictured), Mr. Kenyatta’s opponent in the election, that the vote was “hacked” and that the official results were phony. Instead, the judges seem to have been persuaded that irregularities in the transmission of the results from polling stations to the electoral commission were important enough that the exercise should be repeated. What happens now is anyone’s guess. The result could be “anarchy”, says Michael Chege of the University of Nairobi. At a cost of $500m, the election in August was one of the most expensive, not just in Africa, but anywhere. It involved hundreds of thousands of temporary workers. The government will have to find the money to repeat it. The electoral commission will also have to do a better job than last time—or else risk facing a second disputed result in a year. New lawsuits, disputing races for senate seats and county governors, could also lead to new elections. The economy is likely to suffer, says Faith Mwangi of Exotix, an investment firm. In the run-up to the vote, firms held off on investing, adopting a “wait and see kind of approach”, says Ms. Mwangi. That will continue for at least two more months. The Nairobi Stock Exchange fell sharply after the court’s decision, while the Kenyan shilling weakened slightly. In the end, though, the vote may not change the outcome. True, Mr. Odinga’s supporters will be jubilant at the decision. And they may be more enthused to vote in the next election. But support for Mr. Odinga is more marginal than that for Mr. Kenyatta. Mr. Odinga may also have made himself less popular with swing voters over the past few weeks, says Mr. Chege. His team has talked wildly about “divorce” and “secession” from Kenya. Being forced to fight a grueling campaign all over again could also win sympathy for Mr. Kenyatta. Despite its flaws, the overturned election was probably one of Kenya’s most credible. In contrast to previous votes, violence was relatively limited. Expensive electronic equipment was used to check voters against a biometric database and to stop vote totals from being padded. It broadly worked. International observers gave the election generally positive reviews. So there is concern that, if Mr. Odinga loses again, his supporters still will not accept the result. But if Kenyans see the next election as free and fair, regardless of the outcome, it could herald a new faith in the country’s institutions. That would make future elections less chaotic and controversial. Despite the short-term disruption, it would be worth it.